Our design engineers are accredited with the BOHS P602 qualification ensuring that you will get a system that fully complies with the COSHH regulations. We will visit your site to discuss your requirements. Working together, we will recommend possible solutions and reach a proposed design that meets your performance needs and budget. 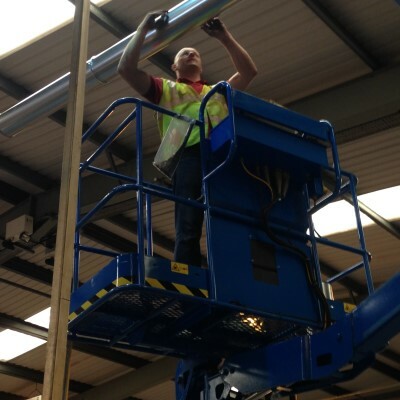 Our engineers are DBS enhanced checked and hold IPAF and PASMA certification for working at heights. Risk assessments, method statements and insurance documents will also be submitted. Upon approval of the design our team of experienced installation engineers will install your new extraction system. Our engineers have years of experience in the field and will complete the installation with the minimal disruption to your production schedule. Upon completing the installation we will carry out a commissioning survey. This will prove that the system is performing to its original design criteria and provide a benchmark for future Thorough Examination and Tests (T.E.x.T).